Here be the resources. Need inspiration? Some mojo? Tips? Tools? To feel less alone in this human experience? I got you. My friend Christy and I were texting today about how capriciously unfair our economic systems can be (sure, sure, we've all tacitly agreed to this system where the "market" decides what is valuable regardless of intrinsic meaning), specifically with regard to how she bought take-out this weekend and spent the rest of the weekend feeling guilty (she is in graduate school) and her cousin just spent $100k of inherited millions on a Maserati on a whim! (he is otherwise unemployed). And then I said, "On the flipside, French lentils, though the most expensive variety of lentil, are still practically dirt cheap and delicious/And always make one feel virtuous." And she said "yes, I don’t know why but a pot of beans cooking makes me feel like everything is going to be ok."
It's good to have a list of things in your back pocket that (almost) always make you feel like everything is going to be okay. That's because having a list of things that usually work is a good antidote to a world full of things that don't work. We're not babies around here, we don't expect everything to be easy for us. We understand it's a complex, chaotic world out there, and part of the fun is fixing things that are broken and making good things even better. However, there are some days where it feels like nothing is working, everything is broken, and you are tired of making the best of things or rigging what you can out of what you have. That's where a list like this comes in handy. It's important, I think, to have a list of things that make you feel like things will be okay. To ground you when you start to feel unmoored, whether the unmooring is due to an overwhelming calendar, a project that won't quite do what you want it to do, or a world that is rapidly spinning off axis. It's good to anchor one's self in one's body, to remind you that you do have a body, and not just a brain with steam issuing from your ears. Pets are the mammal version of this list--no matter what is going on, touching (or even being near) an animal is almost immediately calming to your body and your brain. 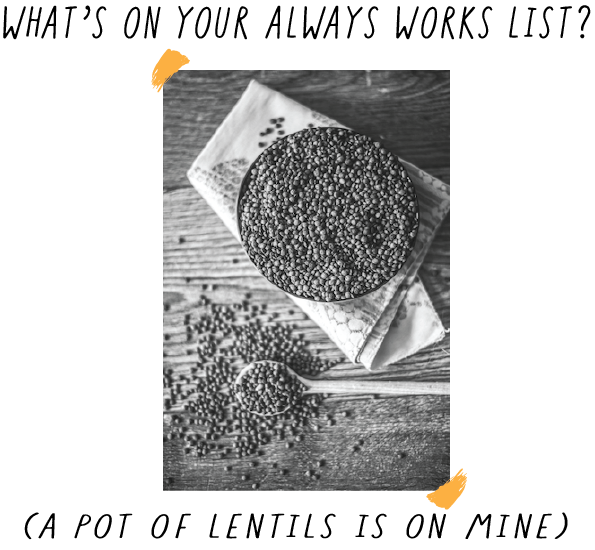 My list is fairly, gloriously, middle-aged: In addition to french lentils, I love walks (even when it's cold and I hate the cold! ), cozy British + Italian mysteries on TV, slathering elaborate oils made of seeds on my face (favorites: raspberry, papaya, melon), a stack of magazines (physical ones are best, but the Texture app provides sheer quantity that is satisfying and environmentally sound), and herbal tea that makes me feel like I am witch. I also love a crystal-y hard cheese with honey. One thing that is lovely about this list is that I can have each of these things everyday, and it doesn't diminish my enjoyment of them. Do you remember to build things that you love, that make you feel grounded, into your day to day life?